Liverpool manager Brendan Rodgers says Steven Gerrard should be fit to report for England duty on Monday after being substituted in the win against Fulham with a long-standing hip problem. 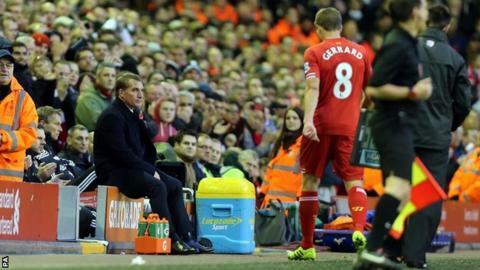 The England captain was instrumental in Liverpool's 4-0 victory at Anfield but left the field after 67 minutes. "He had had a wee issue with his hip, where I can rest him I will," Rodgers said. "I haven't spoken to the medical team, but he should be fine [for England]." England play Chile and Germany in friendlies at Wembley in the coming week, with manager Roy Hodgson having just three matches until he has to name his squad for the 2014 World Cup. The England manager will have been encouraged by Gerrard's performance at Anfield, with his set-piece delivery a key feature of Liverpool victory over the struggling Cottagers. Rodgers admitted his captain's ability from the dead-ball was something he wanted his side to capitalise on. "Steven's delivery is as good as it gets - no-one delivers a ball like Steven," Rodgers said. "Every week I ask him where I want him to put the ball and he puts it there. And you saw with two of our goals - the free-kick and the corner - there was incredible quality on his deliveries." Rodgers admitted he was pleased with the relentlessness of his Liverpool side, who have developed a knack of dispatching lesser teams at Anfield without fuss. The Liverpool manager did not, however, get drawn into making predictions on how far his side can go this season. "We are taking it game by game," he said. "That is seven games we have won now [this season] and when you tag that on to [our form since] January it shows we are collecting points. "When I first came in here there was a real vulnerability, nervousness around the group ahead of these games for some reason. "But now the mentality is good, the focus is good and we are becoming relentless in these types of games and that is what Liverpool is about. You have to give massive credit to the players."